If you have never been in a submarine gliding silently and effortlessly along a coral wall teeming with marine life, you are in for a big treat. The US-Coast-Guard-approved Atlantis XI is a 65-foot long battery-powered submersible specially designed for underwater sightseeing adventures in tropical waters –– and where better than the Cayman Islands, with some of the clearest waters in the world. We were on a fun-filled seven-day Princess Western Caribbean Cruise. We could have signed up for our underwater tour on board ship, but opted to take a stroll and get tickets at the Atlantis retail store located on the waterfront in bustling George Town, Grand Cayman's capital, just a two-minute walk from the bustling docks where the cruise ship tenders deposit passengers. The inside of the well-provisioned Atlantis Adventure Center looks something like the lobby of a movie theater, but with the addition of clothes-racks and trinkets for sale. There were also plenty of smiling employees ready to discuss the best tours for the family. After choosing a tour and purchasing tickets, it was a little wait before our excursion was called. We picked up a snack and drink right there in the store while we anticipated our upcoming adventure. In about 20 minutes, our tour was called, and 30 of us boarded a two-level tender that would take us out to the dive site. The change of submarine passengers was very orderly. First the Atlantis disembarked the last tour group to the first level of the waiting tender. Our group was gathered on the second deck, and as soon as all the new submariners were aboard, we were instructed to move down the steps of the tender to the deck of the Atlantis. That accomplished, we entered the hatch compartment, and did a backward ladder descent seven feet into the boat. It was all very exciting. We leveled off at 105 feet and cruised along to the tutoring of our convivial dive guide. He explained that colors dissipate as the boat goes deeper, and how the varieties of fish change with the depth, and – wow, look at that wreck off the starboard bow! We learned about barrel sponges, soft coral and hard coral, and thoroughly enjoyed the easy-to-hear-and-understand narration. You might expect that this tour would not be as exciting as the submarine, and it isn't, but at a greatly reduced price, it comes with superb views of fascinating wrecks, and a knowledgeable narrator who talks about the amazing sea life that passes before your eyes. Because of the unique water clarity, the Caymans are a scuba divers' paradise. 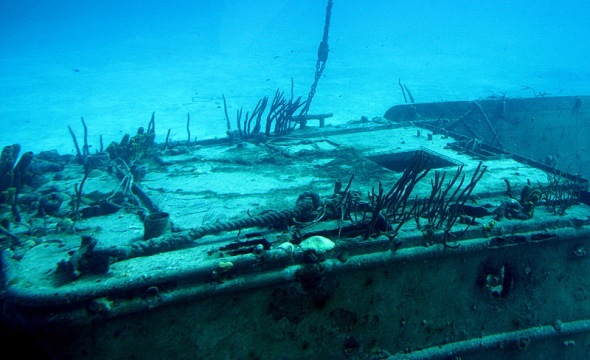 Having spent many weeks on the islands during the now long-defunct annual “Cayman Madness” event, we can attest to the extraordinary dive sites and excellent dive-boat operators. In addition, Grand Cayman is a safe island with a plethora of great ocean front hotels and fine restaurants – and the people of the Cayman Islands are delightfully friendly and well educated. The Cayman Islands are clean, and you can drink the tap water. What's not to like?